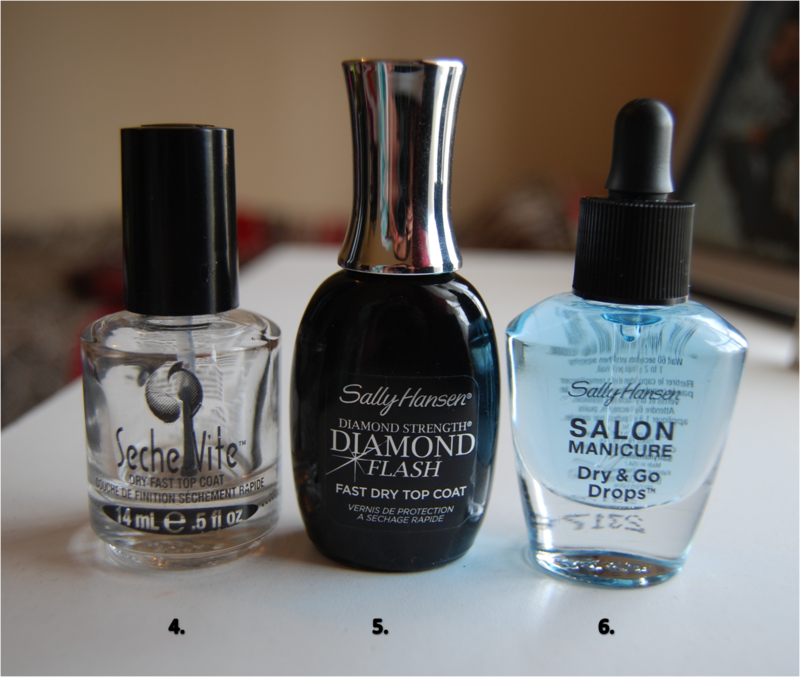 So yesterday I did a blog about my Base Coats and today I thought I would go to part 2; my top coats. Top Coats are just as important as base coat. Top coats protect your manicure. No matter what nail polish you use it will help protect it from bump, scratches and all those chores we have to do throughout the day. And these days a good top coat will also dry your manicure in less than 5 mins, so no sitting around like a loser waiting for the 'paint to dry'. This is the mother load of all top coats. Before I discovered Seche Vite I was that loser sitting around with my fingers out waiting for them to dry. And especially when you are doing a few different layers it is a real pain waiting for them to dry. So along came Seche Vite and made my life a lot easier. Pros: It dries so fast. After you put your nail polish on you can on a layer of this stuff and wait 5 minutes and its done! Pretty amazing. The polish it also really protected under the stuff. You can buy Seche Vita off Ebay for about $5 which is pretty cheap. Cons: Over time it gets quite thick and unusable. It also shrinks the polish the older it gets. I have discovered there is a certain technique to stopping Seche Vite shrinking, but I think that is a pain. You can however by a polish thinner to thin it out again and it's good as new. I have just purchased some one if so hopefully I can test that out soon. I bought this because had run out of Seche Vite, but I am so happy I did. Pros: It is a really great product. It is quite thin which means it spreads evenly. It protects the polish so well. I have worn a nail design for over a week and there was minimal chipping, which is extremely rare with other top coats. This is def a 10/10 product. Cons: It is quite expensive. You are looking at about $16 from Priceline. I haven't had the top coat for very long so I don't know how it will go in the long run. I bought this just as an experiment. It is really good if you have a to get out the house quickly and you want your nail to dry super fast. Pros: Its good for last minute jobs. It is also good if you have a old top coat that is works well but doesn't dry fast. You can just pop this on top and it will dry super fast. Cons: It leaves a oily residue around your nails. You can wash it off, it is not permanent, but it can be a little annoying. It is also a bit expensive, about $15 from Priceline.